Discussion in 'Jazz, Blues, Standards, Ambient' started by siriusfan, Jan 19, 2009. This is one of the best channels on satellite. Once I start listening, I find it hard to switch off. Its costing me some sleep. This week B.B. and Bill start off by discussing some very important blues ladies: Dinah Washington, Little Esther and Etta James. Then, going back to his early years, B.B. tells us about his bus, â€œBig Red,â€ as well as the night life in Memphis and West Memphis. B.B. closes the show with a listener-question as he explains his reasons behind his heavy touring schedules. Happy 87th Birthday BB King! Watch the excerpt of this conversation with B.B. King and Buddy Guy where they take us back in time to their early careers and discuss the struggles that paved their way. Hear more from B.B. King on SiriusXM's B.B. King's Bluesville, SiriusXM 70. Watch the excerpt of this conversation with B.B. King and Buddy Guy where they take us back in time to their early careers and discuss the struggles that paved their way. 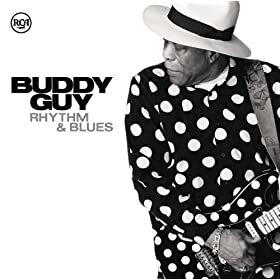 On his new album, Rhythm & Blues, guitarist and vocalist Buddy Guy sums up his approach when he sings, "People always ask me / About the blues I play / I say it just comes through me / I don't know no other way / I go by feel." A few songs later, in "Whiskey Ghost," he trembles as he describes the nightly test of will with a common blues-culture demon. Then, working alongside Steven Tyler of Aerosmith in "Evil Twin," he rolls through Blues 101 tales of woe about getting tangled up with the wrong kind of woman. There are 21 songs on this two-disc set of new recordings, and by the time it's over, Guy and his guests have visited just about every worn-out blues clichÃ©. That would be tedious listening if he were a troubadour. But in his music, the lyrics are really just there to set the scene. The jolts start after the verses, when Guy begins to play. His guitar â€” a custom Buddy Guy 1989 Fender Stratocaster â€” is more than hot-wired. It sounds like it'll give you a blistering burn if you get too close. Every time Buddy Guy steps out, even if he's just doing a quick ad-lib between lines, he delivers something profound. That guitar wisdom, dispensed so casually, is the element no producer or record executive can order up. Guy is among the last living links to Muddy Waters, Howlin' Wolf and other towering figures of the blues. And if you can't hear that in the slickness of the arrangements or the glitter from the celebrity guests, just be patient. The next guitar solo will come along in a minute or two, and then all that history will be inescapable. The mighty Jonny Lang rolls into Bluesville to hang with his friend Pat St. John and talk about his latest album “Fight for My Soul” as well as play some smokin’ live tracks. Blues guitarist Gary Clark Jr hits Bluesville for a live performance and a chat with the channelâ€™s Tony Colter. Here some faves from Gary as well as a Jimi Hendrix cover and maybe even a snippet of Black Sabbath! Former Deep Tracks host Pat St John has something special lined up for us tonight! THE DEVIL YOU KNOW: Join BB King's Bluesville celebrate the new album from Tommy Castro & The Painkillers "The Devil You Know." Starting in the 6pm ET hour today with Pat St. John, get a new song from the album every hour thru the entire weekend. Plus, we'll do it again this coming Tuesday which is the first day the album is available to the public. Congrats to Tommy Castro on another killer record! Gary Clark is a badass! Nothin but respect.